Clear Creek State Park encompasses 1,901 acres in Jefferson County. 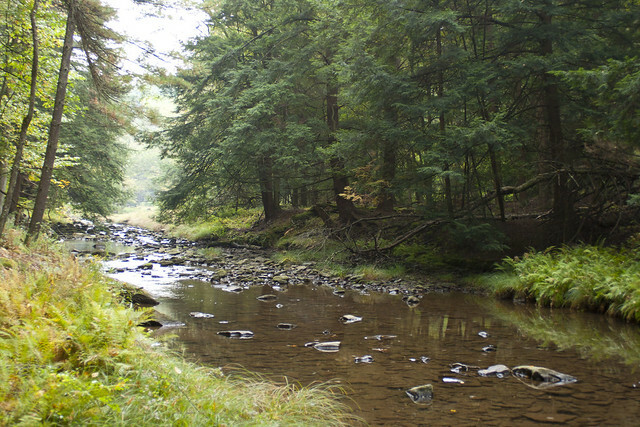 The park occupies a scenic portion of the Clear Creek Valley from PA 949 to the Clarion River. The park has camping, rustic cabins, and Clarion River access for fishing and boating. Cook Forest State Park is only 11 miles away. The park is located off of PA 949. From the east, take Exit 78 of I-80. Follow PA 36 north to the town of Sigel, make a right onto PA 949 north and continue four miles to the park entrance on the left. From the west, take Exit 73 of I-80. Follow PA 949 north for 12 miles to the park entrance on the left. There are two seasonal scenic overlooks in the park on the Tadler Run Loop Trail. Beartown Rocks is a popular nearby overlook in Clear Creek State Forest. Feeding wildlife is prohibited. When wildlife loses its fear of people, they can become pests, and dangerous situations can result. Programs are offered spring through fall. Curriculum-based environmental education programs are available to schools and youth groups. Teacher workshops are available. Group programs must be scheduled in advance by calling the park office. A nature museum with logging and nature exhibits is open spring through fall. The Ox Shoe Trail is self-guiding, takes one hour to hike, and reveals the logging history of the area.